Faiza, a recent divorcée aged 28 years, was born to a poor family. Face down, she lay motionless on the hospital bed, with both her legs fractured. One leg was plastered while the other, which had sustained multiple fractures, awaited surgery. The surgery was possible only if the financial costs were met. She had no nurse to attend to her; her breakfast remained untouched, hours after it was served. She was unable to eat without assistance. Faiza, along with three minor dependants, was the head of a single-parent household, and a survivor of domestic violence. She was hit by a car while crossing a busy road on her way home from a house where she served as a domestic worker. Minutes before the accident, she had purchased some vegetables to be able to prepare a meal for her children. Faiza’s pain, confusion and helplessness were evident. She complained of exhaustion. Signs of grief were apparent on her face. She related the dark memories of the physical, emotional and mental abuse that she had suffered at the hands of her drug addict spouse for 12 long years. She was still suffering from the trauma of abuse and divorce when the accident occurred, further adding to her misery. 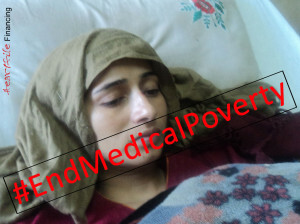 Initially, Faiza refused the needed care and treatment due to financial constraints. She worked as a domestic worker, complementing her earning by tailoring for ladies. She was a trained seamstress but could not depend on this skill for survival as she had no regular clients. She was now fearful of her inability to work for a long time. She thought her anguish and pain would prolong. “I feel so helpless. It is as difficult as hell for me. Yet, I will not give up and will continue to live and strive for my children,” she said. Her immune system had weakened partly due to stress resulting from long years of physical and psychological abuse. Self-neglect was also apparent in her case. Domestic violence has had grave consequences on Faiza’s physical and mental health. She maintained that the violence she endured had enhanced her resilience; she had taken control of her life and was now living as a single mother on her own terms. At the same time, she looked depressed and anxious, chronically fatigued, isolated and withdrawn. With Heartfile’s assistance, Faiza managed to cover the treatment costs of the physical injuries caused by domestic violence. No attention, however, was paid to her psychological problems and anxiety. She has been unable to shrug these off. Perhaps, she may never be fully restored.